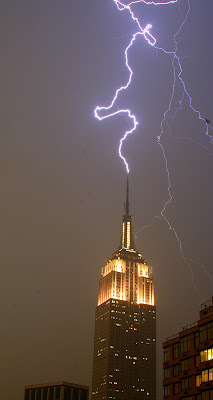 The next time you visit New York, be sure not to park your car near the Empire State Building. It's not the threat of pennies flung from the building by mischievous tourists--or the base jumpers who attempt to parachute from its upper stories--that should convince you to keep your distance. According to the Daily News, the five-block radius around the Empire State Building is a Bermuda Triangle for cars. Engines stall. Batteries die. Car doors refuse to open. Over the past few years, hundreds of people have had their cars towed, only to discover that they function perfectly the minute they're out of the skyscraper's shadow. Are radio transmissions from the building to blame? Is some sinister force at work in New York's greatest landmark? Or is it all just an urban myth? Read the article, and decide for yourself! That's so interesting! The picture is cool. Tha picture is so awesome, and the article is really interesting to, I'm gonna look at how they built it to see if anyone died or something. Also, Annaka, what's your e-mail? Wow. Maybe it is because of the major electricity thing going on with the lightning. Hmmm. Does the same thing happen wih any other buildings of note? Hmmm. That's very odd. I'll try to do some research on that. That's what I though, IM - electricity. How much is used in the Empire State Building? Or maybe it's the curse of the demon skyscraper builders... out for revenge against the public that caused them to be buried inside those iron walls. Cue spooky music. The time of the hungry ghosts is nigh! I know! The cars are scared that it will fall on them, so they won't go near it. Fascinating. It could be useful if you don't want to talk to someone on the phone, just walk towards the Empire State Building! Amazing! I had never heard about that, it's really cool!